As any genre fan can tell you, it’s not easy to pull off a solid horror comedy. It’s even harder if you’re attempting to stir in a little self-referential, meta commentary to the horror-humor pot. It only really works if the filmmakers involved have a genuine love and affection for the genre, allowing them to poke gentle fun of genre conventions and clichéd tropes without coming off as snarky or insincere. 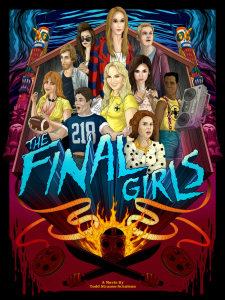 The Final Girls follows a group of modern youths who find themselves inexplicably trapped in a cheesy 80s slasher film. Although the savvy teens are well aware of the conventions for the film they’re trapped in, they are still susceptible to joining its body count. Based on an exceedingly clever screenplay from Mark Fortin and Josh Miller, Todd Strauss-Schulson expertly directs this funny and surprisingly heartwarming film that could only be made by a true scholar of the genre. The film begins by establishing the endearing bond between a teenage Max (Taissa Farmiga) and her veteran-actress mom Amanda (Malin Akerman). Max is a super serious teen who worries about paying the bills, while her carefree mom focuses on landing her next role, frustrated by her inability to live down her most famous role as a B-movie scream queen in the cult classic Camp Bloodbath. A tragic car accident takes Amanda’s life and leaves Max a melancholy orphan. Fast forward three years and Max is pressured to attend a special screening of Camp Bloodbath with her quirky best friend Gertie (Alia Shawkat) and her geeky superfan stepbrother Duncan (Thomas Middleditch). Also along for the night are Chris (Alexandar Ludwig), the handsome object of Max’s affections, and his clingy ex-girlfriend Vicki (Nina Dobrev). When a couple of drunk theater patrons accidentally set the cinema on fire during the screening, a panic ensues. Max and her friends escape by cutting a hole through the screen, only to find they’ve been transported to fictional 1986 where they are now stars in the film. Once they figure out what’s going on, they pass themselves off as extra camp counselors until they can determine a way out of their predicament. They join the cast of walking stereotypes from Camp Bloodbath, including the sweet shy girl Nancy (Akerman), the womanizer with a one-track mind Kurt (Adam Devine), the ditzy blonde who likes to party Tina (Angela Trimbur), the no-nonsense chief counselor Paula (Chloe Bridges), and the New Waver/token minority Blake (Tory N. Thompson). They’re all being stalked by Billy Murphy, the unstoppable Voorhess-inspired masked serial killer. Like Jason, Billy is a killer with a grudge hell bent on revenge from a tragic bullying incident decades earlier. At first, Max and her friends try to stand on the sidelines and watch the preordained events of the film play out without interfering. However, when it becomes clear they are as vulnerable as everyone else, they decide it’s in their best interest to try to put an end to Billy’s murderous rampage. The film works on so many levels. First, and most importantly, this clever deconstruction of horror is genuinely funny. From the film’s countless meta in-jokes to the fun had at the expense of all-too-familiar slasher stereotypes and innate sexisms of the genre. The cast is delightful, with Trimbur, Devine and Middleditch shining as the film’s primary comedic drivers. Trimbur is especially captivating in her small but memorable role. She looks like she could have legitimately stepped out of an 80s slasher film, and her performance is comedic gold. Akerman and Farmiga have exceptional chemistry together, and their mother-daughter relationship is believable and adds real depth to the story. In this way, the film also works as a touching film about nostalgia and grief and the difficulty of letting go. While the film borrows heavily from its genre influences, it still manages to be utterly original. The imaginative re-creation of the doomed stereotypical characters and summer camp setting is faithful to the genre, but the introduction of an entirely new level of cast dynamics with the addition of Max and her friends adds a smart, modern sensibility. 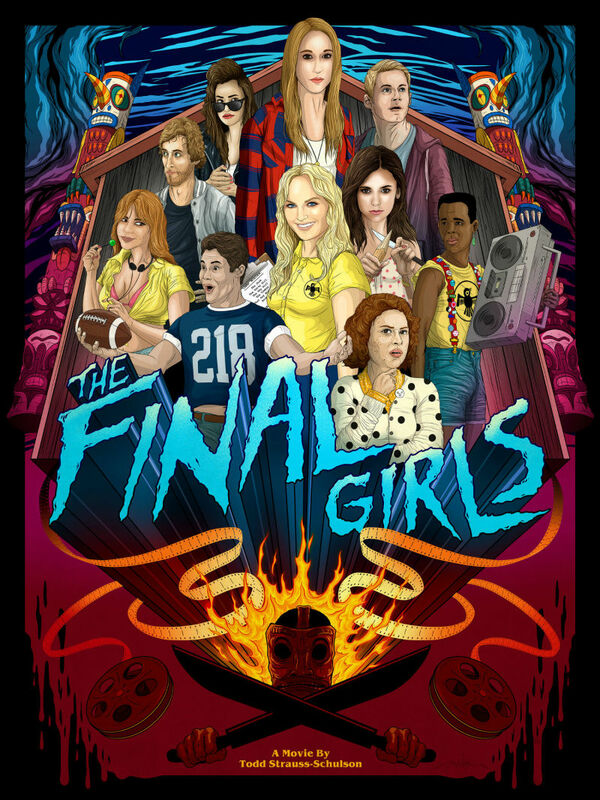 The Final Girls is almost flawlessly executed and does an impressive job balancing horror and comedy, deconstructing the genre while simultaneously paying it loving tribute. The vintage pop soundtrack is divine, as is Gregory James Jenkins’ period-perfect synth score. The cast is top notch, delivering solid performances across the board. And the film surprises by showcasing genuine emotion and heart.